Lights….camera…..action….and cork. With the highly anticipated movie Tomb Raider having hit the screens to international acclaim, it is worth noting that cork took on one of the minor roles. 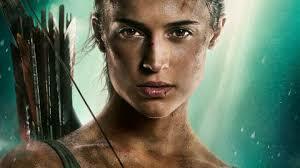 This tale of action-hero Lara Croft’s search to find her father’s last known destination hoping to solve his disappearance, includes spectacular stunts, incredible special effects and awe-inspiring visual elements that were made possible by deploying cork as a vital part of the set structure. Viewers of these no-holds-barred action movies will, for example, be familiar with the copious amount of debris flying around on screen after an accidental or planned explosion, such as those used in an attempt to get rid of Lara Croft or deployed by her to knock-off the bad-guys. Well, in Tomb Raider it is granulated and other cork particles that are sent blasting through the scene – and for a logical reason. Real sand, dust, rocks and chunks of metal and wood would cause a painful and debilitating degree of damage to people and other objects on set. But being light in weight and gently textured, the chances of damage after being hit on the head by a piece of cork is very limited. Thus, the deployment of this material in loud explosions and visceral projectile-flying to ensure a spectacular scene without any collateral damage. Part of Tomb Raider was shot in Cape Town and surrounds where Amorim cork was not only used in the special effects arena, but also to construct the spectacular and atmospheric tombs scene in the movie. Here Lara Croft, played by Swedish superstar Alicia Vikander, would have found it physically agreeable to raid her tombs due to the lightness and functionality of cork. As a major supplier of cork, Amorim is honoured and privileged to have made Lara Croft’s task a lot easier in opening her tombs as well as allowing the production team to present such convincing special effects for the entertainment of millions of people who will see this smash movie. Worth popping a Champagne cork for. Cheers!